Debbie Lopez dumped Joseph Torres, but kept the engagement ring. He sued to get it back, but a judge ruled Lopez could keep it because Torres never "properly" proposed when he gifted Lopez the $10,000 ring. The one she wore on her left hand? On her ring finger? You know, like any old gift ring? He claimed he proposed to the Valley Stream brunette in an emotional April 2010 moment at Rockefeller Center, when he had the couple's 6-year-old son hand her the ring. Lopez, 48, wore it on her left ring finger and even told friends "Maybe, I don't know yet," when asked if she was engaged, according to court records. But after the couple split in 2012, Lopez refused to give up her pricey hardware without a fight. She claimed she didn't have to surrender the ring because Torres, 52, didn't actually propose marriage when he gave it to her. "When he gave it to me, he said it was a gift for being a great woman, a good mother of his child," Lopez told The Post. I of course have no idea what happened at Rockefeller Center, how emotional it truly was, or if Torres really proposed or not, but they do have a kid together, so probably it will all shake out. What I do know is that while discussing this story earlier today with friends, we concluded that this would have never gone to court if only these people had followed the Basic Engagement Ring Rules for Normal People: the proper etiquette for what to do with the ring when an engagement is called off by people who are not extraordinarily wealthy and therefore do not already have legal agreements drawn up for precisely these types of situations. Together we determined that, in the event of an engagement breakup, there are a few simple rules that should be shockingly easy to observe, with a few common sense caveats. If the person who receives the ring ends it, that person is duty bound to return the ring. Right? I mean, if you break up with someone you were gonna marry, you do the classy thing and say, Here is this expensive or at least sentimental ring you bought me that I will not be wearing for the rest of my life. You bought it. You keep it. That is the thing you do. They could insist you keep it (we'll get to that), and perhaps you could if you felt that was a sincere offer. But probably, you should give it back. Insist to do so. Nicely. If the person who gives the ring ends it, the receiver may keep it. Right? If the person who gives you the ring is like, Sorry, no can do! then they will probably, out of guilt or kindness, say, No please, keep the ring, I could never give to someone else and don't want to be crass and take it back. You could then insist they take it back, but you could also keep it as a gesture, as an all's-fair, as a token, or as a way to knock out some lingering debt they no doubt helped you rack up anyway. 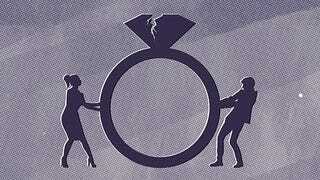 If the breakup is agreed upon, a mutual, mature discussion as to what to do with the ring should follow. Caveat: Whatever you agree upon, NO TAKEBACKS though. Personal Anecdote: I was engaged once, and it didn't work out, but ended amicably at first. The ex said I could keep the ring, I said no, but he insisted, and so I kept it. Then a few months later, his NEW GIRLFRIEND asked for it back. She was "just wondering if I still had it?" Because "they wanted it and could use the money?" I sold it that day. Which reminds me: If you end up needing to get the law involved, what happens next will depend on your state's particulars and whether the courts in your 'hood consider an engagement ring a gift, or a conditional gift, or compensation of some kind. Also at issue is how much your state cares who ends the relationship. But if states are at all like people, they care very much who does the ending, and want the ending person to suffer a little. We all do? Subset caveat: "Unless he like, fucked your mom," said a friend. "Then you give the ring back to his sister who you can tolerate but also burn every one of his other possessions." Then dust off those ashes, get back out there, and stay optimistic! It was just love! It was just your life! And maybe, you know, put a lawyer on retainer.